Before I hit the streets with Mr S looking for high-fat lunch and Tennessee action, I wanted to quickly grab the hotel computer to say how truly happy and excited I am for the Minerva Crafts Blogger Network. I feel so lucky and honoured to have been selected for this new venture and can't wait to show you all my first make. I'll be taking pictures of my dress in Memphis. What better then to introduce my first make from the home of my boyfriend, EAP. Stay tuned, it will published on my birthday! What a great coincidence and b-day pressie for moi. Hopefully you all know by now that Minerva Crafts have launched a blogger network. I am part of an amazing team of 8 - you can find out who else is in the network on the official Minerva Crafts website. Each month, we'll each blog a post showing an outfit or craft we have made using fabric from the amazing variety on offer on the Minerva website - and believe me when I say variety, I mean billions of things to choose from. 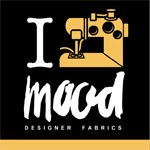 Okay, not billions, but there is so much choice it's a mecca for the fabric enthusiast and yeah I am looking at YOU. And, what's more, Minerva are a family-run company with such kind and excellent customer service. I've really enjoyed my correspondence with Vicki in getting this network up and running. I can't recommend them enough! For each make, the team will use patterns, fabric and notions and if you like it you can buy our kits! We'll each have our make made up into a kit that will include everything you'll need to recreate our look. I love this idea, especially because each blogger will no doubt give you insight and tips into how best to work with the chosen fabric, pattern or notions used. I hope you all enjoy following our makes. Thank you to Minerva Crafts for such a great opportunity and good luck to the rest of the girls on the network, I can't wait to see what you do. Rachel has already posted her first make, which you can find here. I have seen this dress in person and it looks stunning!